The sacraments are defined as "efficacious signs of grace, instituted by Christ and entrusted to the Church, by which divine life is dispensed to us through the work of the Holy Spirit." Fundamentally, the sacraments are celebrations that reveal and make present the sacred in each of our lives. They help us experience more closely the saving presence of God's action in our world. Being aware of the beauty of these celebrations helps us enter more fully into the power of a sacramental way of life. Explore the headings below to learn more about each of the seven sacraments. 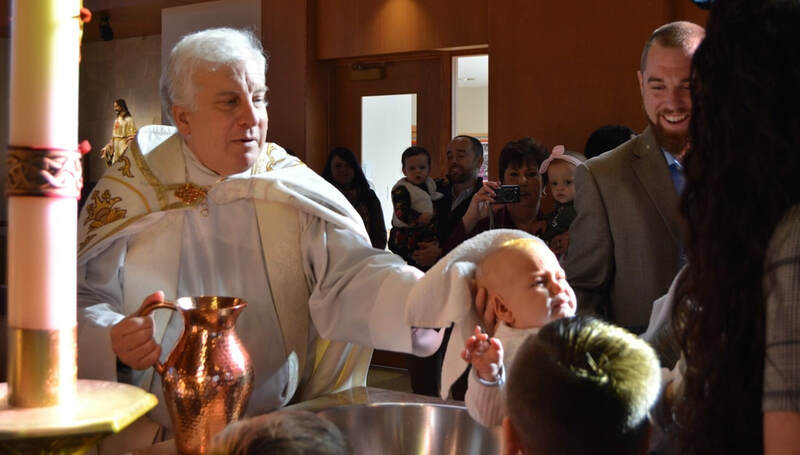 The Sacrament of Baptism is usually celebrated at 12:30 p.m. on the first three Sundays of each month. Please contact the parish office for all scheduling and baptism arrangements. 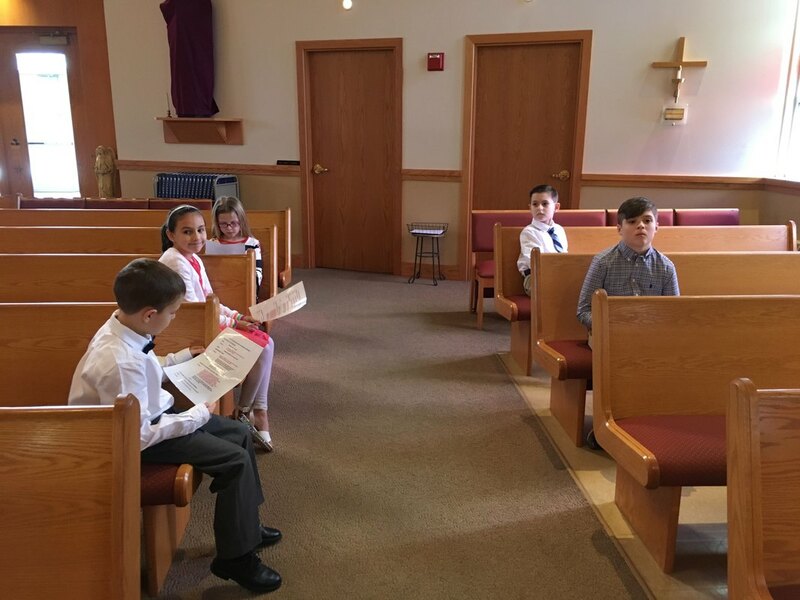 The Sacrament of Confirmation is administered by the Bishop to the sixth grade children of our parish in the winter of each year. Candidates must complete a program of study, prayer and service, in which their parents are also involved.Teenagers and adult Catholics who have not yet been confirmed should notify the rectory as soon as possible. Adults are confirmed at the special Confirmation Liturgy celebrated for adults each year by the Archbishop at the Cathedral-Basilica of Sts. Peter and Paul. Please call the rectory to obtain a letter of eligibility to become a Confirmation Sponsor. The children of the parish receive the Sacrament of Holy Eucharist for the first time during 2nd grade. As with First Penance, candidates and their parents are required to take part in a period of study and prayer. All of this parental preparation is an outgrowth of the Church’s teaching that parents are the primary teachers of their children in the way of faith. The funeral director makes all arrangements with the Church for the Mass of Christian Burial. Family will be contacted by the Parish Office to coordinate hymns and readings. View our Funeral Planning Guide here. View our Music Planning Guide here. All members of St. Catherine of Siena Church, living and deceased, are remembered in a special weekly Mass celebrated by the Pastor. All weddings must be arranged with the priest no later than 6 months prior to the wedding date. All Catholics are required to be married in a Catholic Church (either the Church of the bride or the groom); in the case of inter-faith marriages, permission may be given for the wedding to take place in a non-Catholic Church. The engagement period is to be seen as a time of intense preparation for the lifelong commitment of married life. The couple must understand fully the meaning of the vows they will exchange: to live together and love each other for life, to be faithful and true to each other and to be open to the blessing of children. Our program is meant to chart the way a couple must walk together as they prepare for their living and loving together in marriage. View our Wedding Information Booklet! Any parishioner who is ill, infirmed or a shut-in, may receive Holy Communion at home. The Eucharist is brought to the sick in their homes once a month by the priest and every Sunday by Eucharistic Minister. Please notify the rectory if someone in your home is ill or shut-in so that we may care for his or her spiritual needs. Those whose conditions warrant it also receive the Sacrament of the Anointing of the Sick and if near death, final Reconciliation and Communion (Viaticum) and thon. 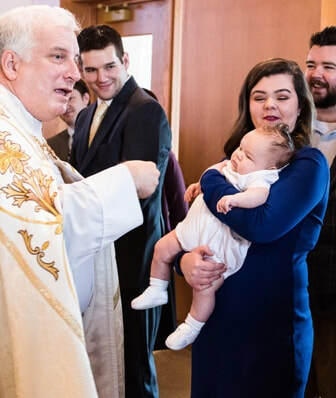 Those who are hospitalized receive the sacraments from the full-time chaplain or from the priest whose parish has the pastoral care of that hospital. If a relative is hospitalized, please notify the rectory so that we can place him/her on the sick list and possibly visit them in the hospital as well. The children of the parish receive the Sacrament of Penance for the first time during the 2nd grade. Besides the preparation of the candidates, their parents are involved in a program of catechesis. During the school year, the Sacrament of Penance is celebrated during a Communal Service (during school time) in October, prior to Christmas, prior to Easter and at the end of the year. PREP children also celebrate Penance in a Communal Service twice a year, in preparation for Christmas and Easter. Parents are expected to join with their children on other occasions in celebrating Penance during the regular parish schedule. Penance is celebrated on Saturdays at 3:30 p.m. until 4:30 p.m. in the main Church.